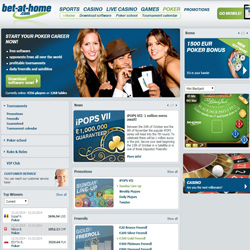 bet-at-home Casino is among the most popular gaming destinations online. Since introducing its internet casino services in 2005, they have set a precedent by establishing new gaming standards. One of the strongest aspects of the site is that their customers never lack anything, as all of their needs are met with great attention. The software that powers the site is Net Entertainment, one of industry’s most established system providers. The software helps keep the site running with great efficiency while also providing the necessary playing options that customers want to see from a modern gaming site. There are total of 83 slot titles available on the site, while numerous other fun games are featured in the amazing portfolio. Players can wager on 18 different table games, which promise to rewards them with massive prizes. bet-at-home Casino can also be played on mobile devices so players don’t have to worry about accessibility. For any inquiries or concerns that may arise, players are always welcome to contract the customer support team. They can be reached via live chat or email, while for more urgent cases players can directly call the customer support department to solve their issues. bet-at-home Casinois powered by Net Entertainment software which allows it to provide an exceptional gaming services. The system in place makes sure that there are no technical hiccups, so players never have to worry about their playing time being interrupted. bet-at-home Casino maintains an impressive portfolio of games that includes different variations of Blackjack. Players can choose from Blackjack Classic, Blackjack Single Deck or even Double Exposure Blackjack. There is also the option to play Blackjack on mobile devices go players are always covered when it comes to that area. Players have a wide array of games available at their disposal. Customers that like to wager on table games can do that with Baccarat, Pontoon, American or European Roulette, Oasis Poker, Red Dog Progressive, TXS Hold’Em and many others. While players that prefer to experience the sort of fun and excitement that comes with slots, are free to try out any of the 83 titles on the incredible site. Some of the most played slot are: Thrill Spin slot, Wild Turkey slot, Golden Shamrock slot, Simsalabim slot, Robin Hood: Shifting Riches slot, Secret of the Stones slot, Wild Water slot, Lost Island slot, Attraction slot, Go Bananas! slot and many more. 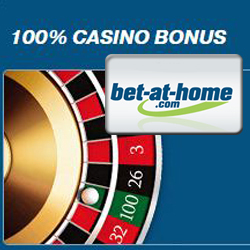 bet-at-home Casino provides great bonuses and promotions for its dedicated players. After players register with the site they can claim a welcome bonus of 100% up to a total of EUR 100. While with through promotions they can earn Comp Points and other cool prizes that are handed out on daily/weekly/monthly basis. By providing all the necessary playing options, promo offers and other cool services, bet-at-home Casino has managed to establish itself as a household name in the gaming world. There are a plethora of titles to choose from which will keep players well entertained and highly rewarded for hours on end. With its mobile capabilities, Bet-at-home Casino offers a broad and an encompassing service that sets it apart from others. 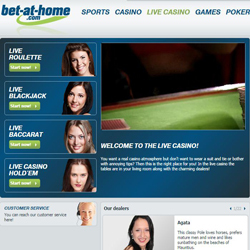 bet-at-home Casino has a great live dealer section that will provide the ultimate table experience. Players bear options in their gaming preferences, whether that be Live Roulette, Live Casino Hold’Em, Live Roulette and of course Live Blackjack. bet-at-home Casino can be accessed on all the most popular mobile devices, including: Android, Apple iOS, Microsoft Windows, Blackberry and others. Customers can try their luck with the fun Roulette Touch or more importantly the Blackjack Touch. They can also play a range of cool slots: Lucky Angler Touch slot, Jack Hammer 2 Touch slot, Mega Fortune Touch slot, Starburst Touch slot, Gonzo’s Quest slot, Piggy Riches Touch slot, Big Bang Touch slot and Twin Spin Touch slot are just some of the many titles.